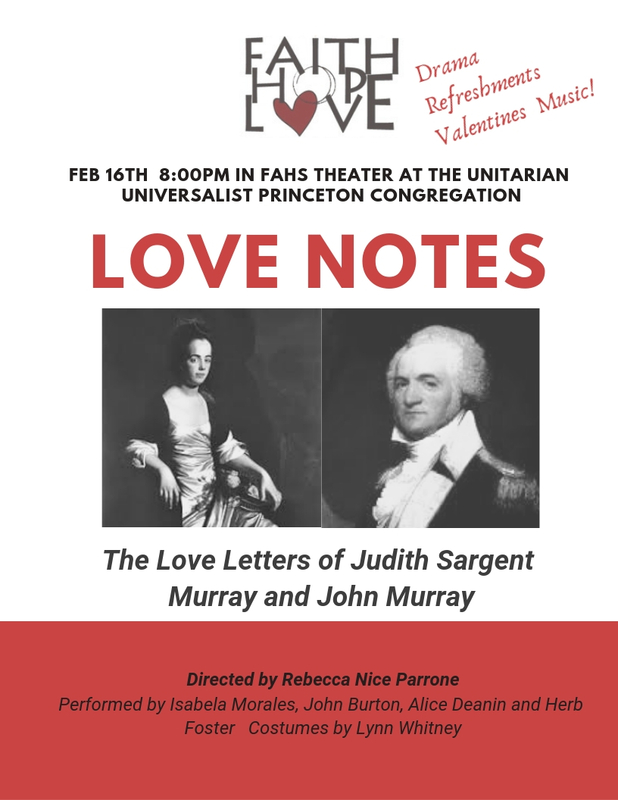 The UU Congregation of Princeton invites you to a performance of Love Notes. It is a musical, dramatic reading of the love letters between John Murray and Judith Sargent, uncovered in a Mississippi house by Gordon Gibson. John Murray of Alton, England, was the first Universalist minister in America. News of his charismatic preaching style and organizing ability as the denomination’s figurehead spread quickly through the colonies once he arrived in New Jersey in 1770 and greed to speak. He caught the attention of Winthrop Sargent of Gloucester, a wealthy merchant and leader of a fledgling group ofo Universalists. Sargent invited Murray to Gloucester in 1774 and he walked through the front door of the mansion on November 3 – into the presence of Sargent’s daughter, Judith. Sparks flew. There was an instant connection. Hundreds of letters followed, through years of legal, political, and familial obstacles. Eventually, they were married in Salem on October 6, 1788. As husband and wife, they were equal partners who loved, respected, and supported each other. In their individual ways – his as a Universalist pastor, mentor to young ministers and organizer; hers as a bold writer who achieved several literary “firsts” in this country, as a correspondent with national figures, and as an educator for her own and others’ children – they worked toward a shared vision of love fairness, kindness, and virtue in THIS world. They knew they would be together in the next world as well.